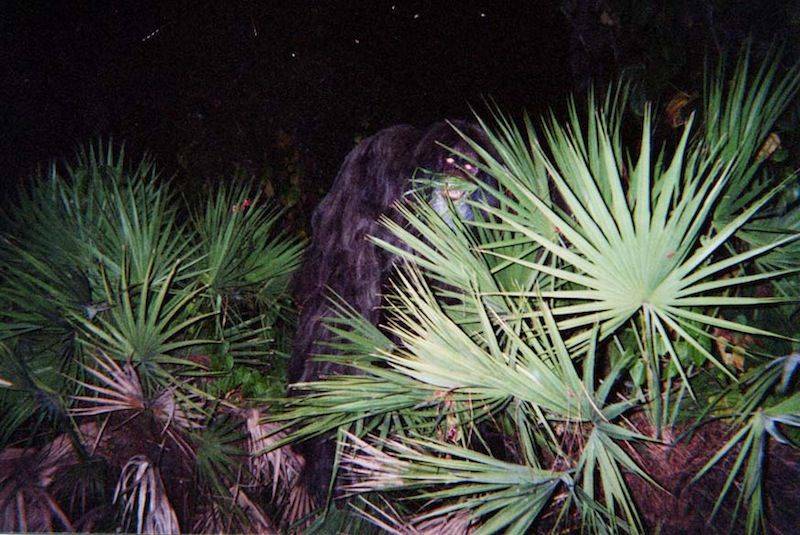 Sarasota County Sheriff’s OfficeA photograph taken during an alleged up-close and personal encounter with the Florida Skunk Ape. This photo was sent to the Sarasota County Sheriff’s Office, along within an unsigned letter claiming that the creature had climbed onto the sender’s back deck. Dec. 22, 2000. Three days before Christmas in the year 2000, a family in Florida awoke to a loud noise on their back deck. There was so much banging and pounding that it sounded like some overweight drunk was knocking over deck chairs, but with all that noise came something that couldn’t possibly be human: A low, deep grunting, and with it, a stench like something was rotting. When they came out to the back window, they saw something they’d never expected to see. There on their deck was a great, huge, lumbering beast, covered in hair from head to toe. The family figured it was escaped orangutan on the lam from the local zoo. But when the photo they took started making its rounds online, a handful of true believers in the paranormal had a different explanation altogether. The monster on their deck, they believed, was none other than Florida’s own Bigfoot: the Skunk Ape. Richard Elzey/FlickrDavid Shealy’s Skunk Ape Research Headquarters in Ochopee, Fla.
One piece of alleged Florida Skunk Ape footage uploaded to YouTube. In essence, the Skunk Ape isn’t too different from Bigfoot, other than a few unique charms. They roam exclusively through Florida’s Everglade forests, often in whole packs, and they’re said to be peaceful and kind. The earliest well-known Skunk Ape sighting happened in 1957, when a pair of hunters claimed that a gigantic, smelly ape invaded their camp in the Everglades. Their story picked up traction and, as it spread, the creature started to pick up its own unique name, inspired by its distinct smell. Dozens of sightings followed. In 1973, a family claimed they saw a Skunk Ape chase their child off a tricycle. The next year, another family claimed that they hit one with their car – and they had hairs in the fender to prove it. A whole tour bus full of people claimed they saw a Skunk Ape in 1997. They described it as “a seven-foot, red-haired ape” running through the Everglades. There were 30 or 40 people in all, every one of them telling the same story. 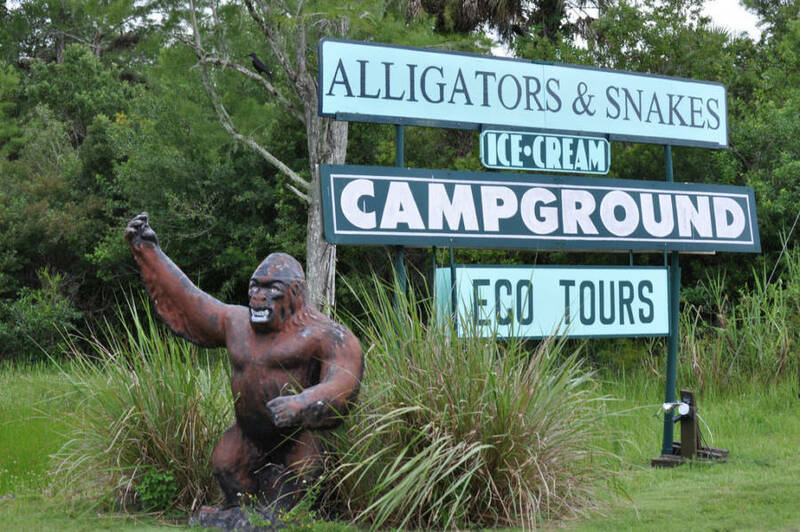 Lonny Paul/FlickrA statue of the Skunk Ape outside of an Everglades campground. The stories of the Skunk Ape go back much further than the 20th century. The Muskoke and Seminole tribes that lived in the Everglade forest before European settlers ever arrived claim they’ve been seeing Skunk Apes in the woods for hundreds of years. They called it “esti capcaki”, or the “tall man.” He is the protector of the woods, they say, and he keeps away those who would damage the forests. 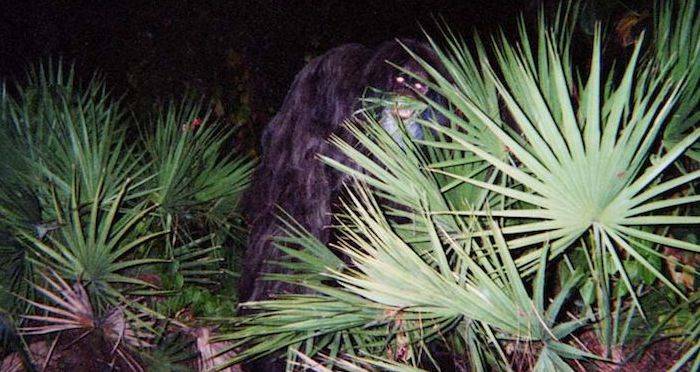 Even when you don’t see the Florida Skunk Ape, they believe, he watches you, forever vigilantly gazing over those who enter his domain and using his mystic powers to vanish into thin air. Footage uploaded to YouTube that allegedly shows the Florida Skunk Ape. The photograph taken by that family that supposedly saw a Skunk Ape on their back deck in 2000 is by far the best-known image of the creature. But it’s far from the only one. There are countless photos and videos allegedly depicting Skunk Apes on the internet, including one taken by Dave Shealy himself. 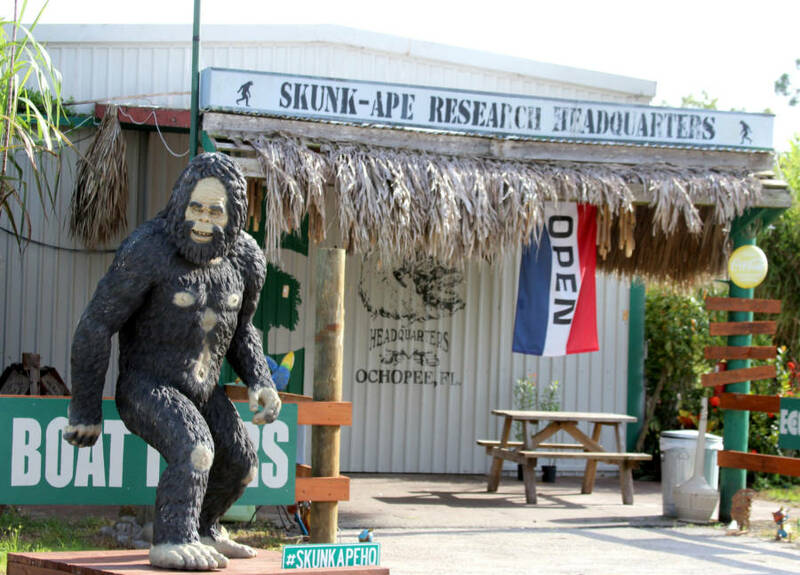 Shealy, in fact, has a whole facility full of Skunk Ape evidence, including a cast of a four-toe footprint from the creature, which he claims was left right next to his hunting camp. Footage allegedly depicting the Florida Skunk Ape that was recorded by Dave Shealy in 2000. His video, though, is his ultimate proof. He filmed it in the year 2000 and claims that it shows the Skunk Ape wandering through the swamp, moving at speeds that would be impossible for any human being to achieve. 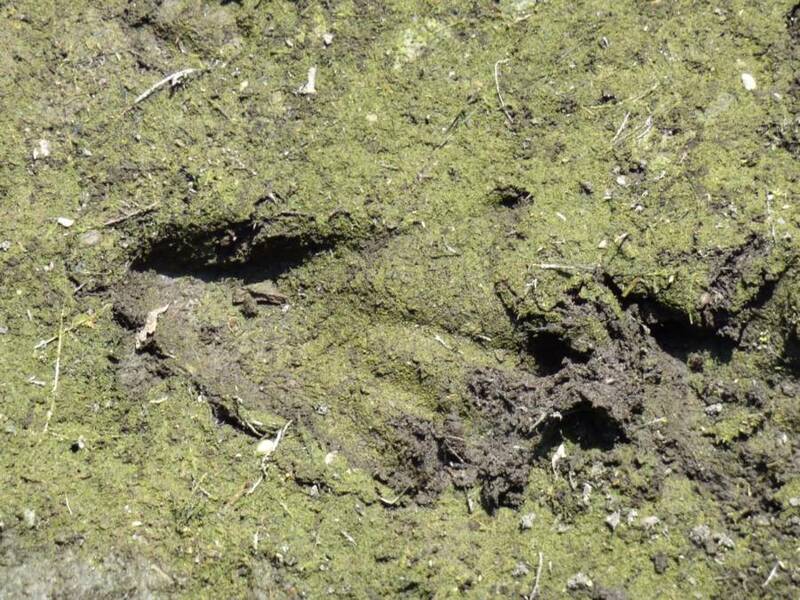 Wolf Gordon Clifton/Animal People, Inc./FlickrFootprints allegedly left by the Florida Skunk Ape. As far as Shealy’s concerned, his video proves the existence of the Skunk Ape beyond a shadow of a doubt. But it hasn’t fully convinced everybody. The Smithsonian, after seeing the video, said: “It’s extremely hard to watch this video and see anything but a guy in a gorilla suit.” Still, for Shealy and the faithful, there’s no question that the Skunk Ape is real. People who believe in the Florida Skunk Ape, one common supposition goes, believe it simply because they want to believe it. Studies have shown that people who believe in paranormal creatures like this one are more likely to engage in “magical thinking” and less likely to internally reflect on what they’ve seen. 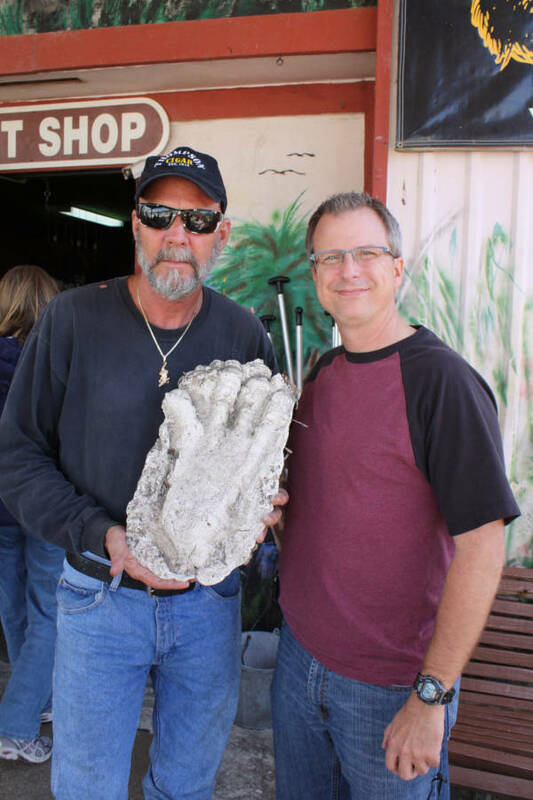 Michael Lusk/FlickrDave Shealy (left) holding up the concrete footprint cast he claims came from the Florida Skunk Ape. 2013. Shealy himself, though, doesn’t quite fit the bill of your usual conspiracy theorists. He openly jokes about some of the people who come to see him and the things they believe, like the belief that only those who have been abducted by aliens can see Sasquatch. Nevertheless, Shealy does seem to be at the center of the whole Skunk Ape story. Several Skunk Ape hunters have cited him as a direct influence, and while some Muskoke and Seminole people have claimed that the Skunk Ape is part of an older tradition, their stories are quite a bit different from the modern stories of big, smelly apes terrorizing people’s backyards. So why is Shealy so obsessed with the Florida Skunk Ape? We may never know for sure, but perhaps he genuinely and truly believes that Skunk Apes are real, or perhaps – as many of the people who’ve interviewed him have very strongly implied – he’s just out to sell a few trinkets at his gift shop. But in the end, it’s a matter faith. We’ll leave it to you to decide whether the whole thing’s a mass delusion, spurred on by one man out for a laugh, or whether there really are six-and-a-half foot tall apes wandering through Florida, just waiting to be discovered. After this look at the Florida Skunk Ape, learn more about the legendary Bigfoot and the other cryptids some insist roam the wilderness.